In 1976, I was a young American diplomat who had been assigned to Johannesburg the year before, following an assignment in Southeast Asia. Trying to understand Johannesburg, and South Africa, meant trying to come to grips with the country’s myriad of racially defined laws – as well as all the other things not actually enshrined in law but deeply woven into the fabric of this society. All of this became like a series of slaps across the face, even though America’s own experiences with racial segregation were still relatively fresh in the Washington, DC area and could have been a partial roadmap. By J BROOKS SPECTOR. The fact that job opportunities were rigorously managed in racial terms, and that the entire country’s residential pattern and its government offices like the post office were strictly segregated, all of this was obvious, given South Africa’s international reputation. That restaurants, hotels and the like were similarly segregated, or just plain off limits for the majority of the country, could be understood – even if it made one furious and frustrated whenever I thought I could meet with someone over a meal – if they were not a white South African. As a result, we got used to using the restaurants in two five-star hotels by virtue of their “international status” (testing the envelope with normal people “sneaking in” as if they were Malawian diplomats going out for lunch) – or the Wimpy at the top of the Carlton Centre office building. Or we met in people’s homes, at Uncle Charlie’s roadhouse (the famous drive-in fast food joint with the old Viking aeroplane mounted on the roof) out towards the south of the city. And then there was also one non-descript guest house in the part of the city zoned for Johannesburg’s Coloured inhabitants whose owners didn’t seem to care who came to eat or drink, just as long as they didn’t make any trouble and paid their bills. But it was the unofficial stuff that seemed to make one even angrier. The chamber music concert series presenting international classical music stars such as James Galway used the Witwatersrand University’s Great Hall. Back then, tickets were hard to come by – people literally waited until someone passed away to get on the roster of ticket purchasers. The hall – like the university – was actually an officially “open” facility, available to all as a fading remnant of the university’s pre-apartheid liberal tradition. But, having been allowed into the inner circle and allowed to purchase tickets, whenever I accompanied a date who clearly was not a privileged white person, those cold, frozen looks we attracted were truly extraordinary. Of course, while such things were galling, they were obviously minor in comparison to the larger, more oppressive dimensions of the apartheid system. A key part of my job responsibilities included becoming better acquainted with the country’s educational, political and intellectual circles. Aside from the obvious task of trying to understand how they felt about their own society and its terrors, yet another task was to understand their views and attitudes about America and then to identify individuals who might, for example, be invited to visit the US so that they could explore the country for themselves and begin to base their attitudes on actual evidence. Of course, overt, direct political activities by black South Africans were pretty few and far between, but that obviously didn’t stop people from having political ideas, attitudes and values. That led us to the leading high schools for African, Coloured and Indian students in the greater Johannesburg area. And that, in turn, led us to organisations such as the Transvaal United African Teachers Association (TUATA) and, among others, the principals of the eight high schools in Soweto. In particular, the president of TUATA and headmaster of Morris Isaacson High School, LM Mathabathe, was a mesmerizing presence. He ran a tight ship in his TUATA meetings – and an even tighter one at Morris Isaacson. Over the years, he had assembled a faculty where, unusually, many of his teachers had university degrees – and many of those instructors had figured out subtle ways to demonstrate their political bona fides to their students – thereby leading them to explore the larger political meanings of their daily circumstances. Back in 1975, it was still easy to imagine South Africa’s political life as something like a bug frozen in amber. It might be terrible but it was almost impossible to see how it might change given the economic, political power and deadly force imbalances. The puppet leadership of those homeland administrations controlled a major share of the country’s population and political movements such as the ANC and PAC had effectively been ground down or driven out of the country and into exile. The major townships were thoroughly under the thumb of government offices that ruled through an intricate web of regulations – especially those that governed an individual’s permission to live in an urban area, rent a house (or build one in specified areas if one happened to be classified as Coloured or Indian), go to a particular school, or get a job – let alone get married. for that you’ll need God’s guidance. The conundrums set out by Sepamla (and in his heyday in the 1970s as a leading member of the new wave of politically conscious poets, he filled large halls with people eager, even desperate, to soak up his coded political messages) kept a subject population so busy complying with apartheid’s legal structures that there had been over ten million separate arrests for pass law violations by the late 1970s – often leading to the convicted individual being forcibly returned to his putative original homeland. Trying to understand this country’s torments, I became increasingly well acquainted with the teaching staff at Morris Isaacson High School. Along the way, I arranged to have both the principal and then the school’s science teacher (a strong Black Consciousness/Black People’s Convention supporter – then one of the few even partially legal political forums) selected for those month-long trips to the US to observe educational and social issues there. As things happened, he was away on that trip for four weeks in late April and early May 1976, just as the Soweto students had begun to come together in increasingly vigorous protests against the government’s sudden decision to impose Afrikaans in place of English as a medium of instruction for science and maths in Soweto’s schools. This decision came despite the fact that students, teachers and parents all opposed the idea and regardless of the fact that there simply were not Afrikaans-speaking African teachers to do the teaching anyway. Even though the protests were becoming increasingly frequent, the teacher and I had scheduled an appointment to talk about the trip so I could do an evaluation of that trip from the traveller’s point of view. This was routinely done so that the people who actually organised the schedules and meetings could figure out what they had done right – or wrong. Anyway, something came up and our originally scheduled meeting at Morris Isaacson on 16 June was brought forward by a day and then I went back to my office to prepare my evaluation. The very next day, of course, everything changed. The students marched out from their schools and then the police began shooting them when they refused to disperse. This was the moment on that afternoon when it became crystal clear South Africans were prepared to use their bodies to make it absolutely clear they no longer were prepared to accept the old way. It was, as the physicists would say, a phase shift – but in human terms, rather than ice melting into water or water turning into steam. But the tale doesn’t quite end here. The evening of 16 June, I sat at the kitchen table with the family of a young black paediatric surgeon who worked at Baragwanath Hospital – then as now the largest hospital serving Soweto. I watched a man who had gone through years of intense study so as to be able to accomplish lifesaving surgeries on the fragile abdominal organs of small children and listen to him tell how he had been in an emergency operating theatre all afternoon, struggling to save the lives of dozens of high school students who had been shot by the police – and how so often those wounds had been in their backs. They had been running away as they were shot and then they were carried to the hospital by convoys of passing motorists. In my office the next day, I found it almost impossible to convince my dubious American colleagues about what I had learned about events of the previous day. The prevailing mind-set was that, yes, the South African regime was often harsh but it did not have the kind of police force that would simply start shooting school children in the back. In fact, in those first hours after the events, it was almost impossible for people to imagine the next decade and a half of what a struggle that was about to engulf this country. And at the height of that fighting against a system those students had first opposed on that crisp, early winter afternoon, it was almost as hard to imagine the country that would ultimately emerge after coming through that fire. Many of those same students fled the country after their rebellion was effectively crushed. And many of them slowly found their way to an ANC in places such as Ghana and Tanzania – although some lost hope and then died of despair in exile. This was an ANC nearly devoid of energy and near-paralysed into somnolent inactivity in its down-at-the-heels diaspora. But these same students brought a tantalising sense of possibility to those long-time exiles. Suddenly it seemed that what they had theorised and dreamt about might even be possible in their lifetime after all, what with all this fierce anger and new young blood. Slowly this new wave was won over to the ANC’s charterist ideology – and away from the black consciousness ideas that had been the motive energy for their initial protests in the mid 1970s. 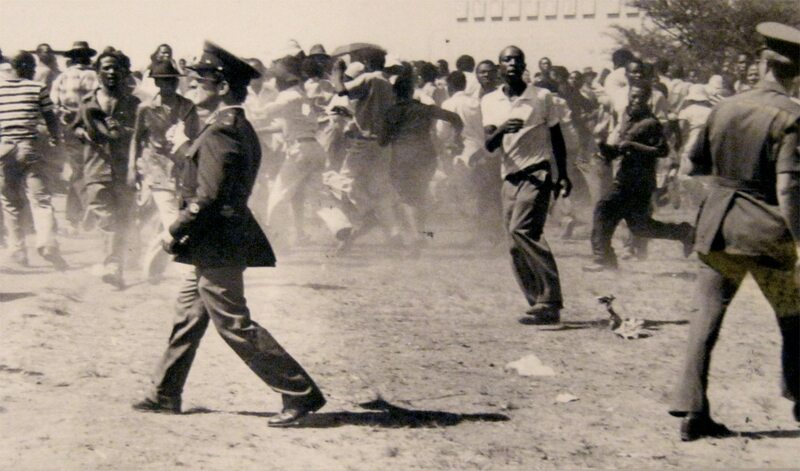 The police rounded up yet others but they gained a political education at Robben Island “University” – now that they were in the company of all those half-forgotten elders who had been out of sight since the 1960s. In time, they would become the shock troops of the armed struggle. When they returned from their own exiles or finished their sentences on The Island, many eventually became the backbone of the United Democratic Front when it, in turn, gained ascendancy in the mid-1980s as the avatar for fundamental social change. Those young students are now distinctly middle-aged. Some are in government positions, some have gone on into academic careers – and some even have quotidian business lives. Amazingly, not a few of them are even coming close to retirement age now. Soon enough they will be like old soldiers, sitting in the warm sun as they tell their tales of youthful courage and derring-do to children who listen politely but then go off to other youthful interests and pursuits.